J'ai toujours bien aimé Blitzkrieg et sinon, Sabbra Cadabra parce qu'il compile les meilleurs moments de deux excellents morceaux et surtout Astronomy parce qu'il fallait la réussir celle-là. Après, je ne vais pas mentir, je ne connais pas toutes les versions originales non plus. The Wait de Killing Joke sans hésiter. La version des Mets est bien groovy !!! Blitzkrieg et Breadfan pour le côté plus rentre dedans que les originaux et le medley Sabbra Cadabra avec le pont enorme ! Next up in the series of METALLICA reissues is "The $5.98 EP - Garage Days Re-Revisited", to be made available in stores on April 13 in time to celebrate Record Store Day. 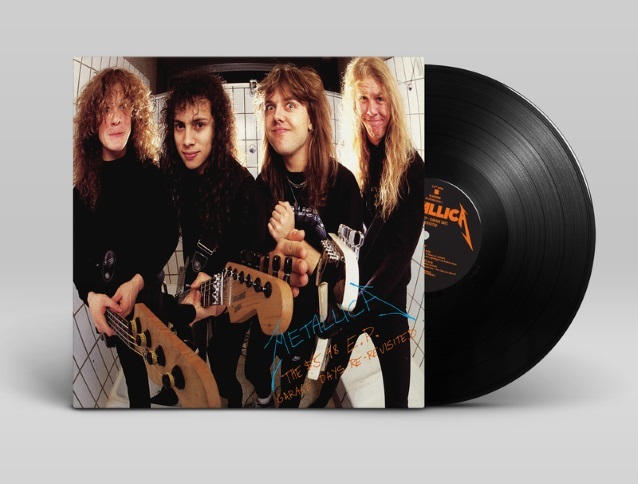 The long-out-of-print EP included five songs that were later released as a part of the "Garage, Inc." double album, but METALLICA thought it would be fun to bring them back now in the original format straight from 1987. Keeping with the '80s theme, the remastered EP will not only be released as a CD and download, but also as several vinyl versions including a picture disc, as a cassette, and in a longbox (you youngsters can search the web for that term!). All Metallica.com pre-orders will receive an instant-grat single of the remastered version of "The Wait". A new trailer for "The $5.98 EP - Garage Days Re-Revisited" can be seen below. "The $5.98 EP - Garage Days Re-Revisited" was remastered by Chris Bellman at Bernie Grundman Mastering in Hollywood, California.